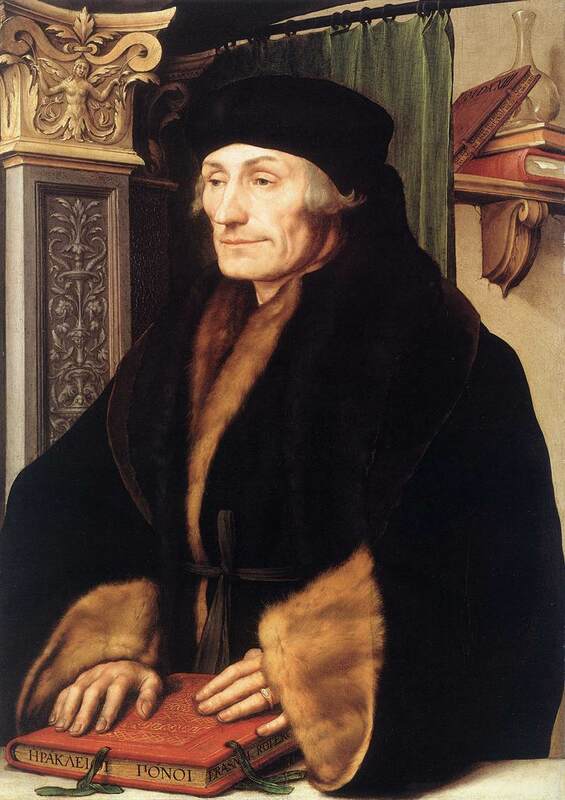 Few figures were as resistant to categorization during the years of the Protestant Reformation as Desiderius Erasmus. He was a staunch critic of church abuses, an advocate for humanism, and a prominent exponent of biblical criticism cited by Protestants and opposed by Catholics, yet he remained Catholic himself and throughout the years distanced himself from Protestant theology. His background itself was something of a mystery. Born in either 1466 or 1467 at Gouda or Rotterdman, he was the illegitimate son of a priest and a physician’s daughter. By 1485, he was an orphan and his guardians ultimately persuaded him to join the Augustinian canons. He was ordained in 1492. He later criticized the pressure to join the monastery and argued prospective monks should wait until the age of thirty six before being accepted. Erasmus had previously been educated in Deventer by the Brethren of the Common Life, popular for espousing their highly personal devotional practices such as those identified with Thomas à Kempis’ Imitation of Christ. He also received an education in humanist letters and this led to a position as Latin secretary of Hendrik van Bergen, bishop of Cambrai. It was not until his later training in Paris and his exposure to humanists in England that Erasmus set off on his course toward intellectual prominence. From 1495 until 1499, he studied theology at the University of Paris. Due to his meager economic means, the fledgling student housed at the Collège de Montaigu, a hostel for poor students. The combination of the living conditions and his exposure to scholastic theology left a negative impression of the hub of medieval universities and the state of late medieval theology. While in Paris, he would first take the Latin name Desiderius as an expression of his humanism. He eventually left Paris without a degree and traveled to England, where he encountered several humanist thinkers who exerted a prominent influence on him. Among them where the future martyr Thomas More, author of the political treatise Utopia, and the biblical scholar John Colet, who impressed on Erasmus the need to pick up biblical studies himself. It was in England that he first stumbled on Lorenza Valla’s Annotationes, a manuscript of textual criticism that would help Erasmus compose his later 1516 critical edition of the New Testament. He also drafted the earliest expression of his famed notion of philosophia Christi (“philosophy of Christ”) in the 1503 handbook for the spiritual life, Enchiridion Militis Christiani (“Handbook of the Christian Soldier”). This idea addressed Christian spirituality as a moral imitation of its exemplar, Christ. After leaving England, he spent several years in Italy. He was awarded a doctorate of theology at Turin in 1506, despite never having studied there. He also did editorial work for a printer in Venice that funded his own scholarship. After the precociously learned Henry VIII ascended to the throne of England, Erasmus returned there in hopes of a position in the court. He instead took a lectureship at Cambridge and, while staying in Thomas More’s home, drafted his influential Moriae Encomium (“Praise of Folly”). There he further developed his notion of the philosophia Christi, only now he specifically plied it for criticism of perceived abuses in the church as an impetus for reform. The treatise was completed in 1511 and reissued with significant changes in 1514. Erasmus’s time in England failed to meet his expectations for a higher provide in church or state, but above all left him lacking sufficient funding to remain. In 1514, Erasmus was granted a benefice to the canonry at Cournai, in Burgundy, that occasioned his return to the mainland and continued studies. The benefice was formally approved in 1517 through a dispensation from Pope Leo X that released Erasmus from both his monastic vows, that prohibited from him living outside of a monastic community, and the restrictions on his taking a benefice, which was the result of his illegitimate birth. By 1515, however, he had already taken an important position as councilor for the Burgundian king, sixteen-year old Charles of Spain, who would in 1519 become emperor and rule over much of Europe during the years of the Protestant Reformation. The new position required his move to Louvain in Belgium, so he might be closer to the court in Brussels, and also resulted in a spot on the Louvain theology faculty, where his progressive study of Scripture and humanist attitude toward scholastic theology caused much friction with the other masters. This period resulted in some of Erasmus’s most influential writings. He published his critical edition of the New Testament in 1516, which included the Greek text along with his revised Latin translation of Jerome’s Vulgate. The same year he wrote a tract summarizing his humanist views on education, Institutio Principis Christiani (“Education of a Christian Prince”), dedicated to the young prince, Charles. He followed those with a 1518 translation of Theodore Gaza’s Greek grammar into Latin, thereby provided a textbook for the introduction of Greek to many humanist students. His most widely circulated writing from this period, the Colloquia (“Dialogues”), was a humanist-styled dialogue covering numerous controversial subjects put to press in 1519. Erasmus remained in Louvain until 1521. By that time, the controversy over indulgences sparked by Martin Luther had swelled into a thoroughgoing reform within Germany and a politically divisive factor in European court politics. The earliest Protestant reformers appealed to Erasmus both as an authority and for support of their cause, even leading to a meeting between him and Frederick the Wise, elector of Saxony and Luther’s protector. The Dutchman was quick to distinguish himself from the reformers, and in order to maintain his independence moved to the independent Swiss city of Basel, where he lived in a house provided by a wealthy printer. He stayed there until 1529. His influence on the Protestant Reformation continued, chiefly in the form of a circle of humanists gathered around him at Basel, which included the later Calvinist reformers Johannes Oecolampadius and Wolfgang Capito. Despite attempts to distance himself from the Protestants, his writings were nonetheless the subject of controversy. The Paris theology faculty initiated an investigation of his works in 1523 and concluded in 1531 with a condemnation of their content. A special conference of the Spanish Inquisition was also devoted to his works in 1527, though the humanists on the court there withheld judgment. Erasmus would continue publishing at Basel, most famously his 1529 treatise on Christian education, De Pueris Instituendis (“Concerning the Instruction of a Child”), which again reflected his humanist values in the area of education. The famous debate over the will between Erasmus and Luther also reached print during the Basel years. It was Erasmus who launched the first salvo in 1524 with his De Libero Arbitrio (“Concerning the Free Will”), in which he attempted to distinguish himself from Luther by emphasizing his own Augustinian character over against the Wittenberg theologian’s hyperbole. Luther responded in kind with his highly polemical 1525 De Servo Arbitrio (“Concerning the Bound Will”), a scathing rebuttal that exposed the Pelagian tendencies in Erasmus’ doctrine of nature and grace. Erasmus retorted with a work published in two parts. The 1526 Hyperaspistes, hastily written upon receipt of Luther’s bromide, dealt primarily with the preface to De Servo Arbitrio and the question of biblical interpretation. The second part, Hyperaspistes II, went to press the following year and addressed the question of free will and attempted to modify Augustine’s more extreme deterministic and predestinarian opinions. By this time, Luther had moved on from the controversy and little attention was paid to Erasmus’s response. The neutrality of Basel to the religious division changed in 1529, when the city went Protestant. Throughout his time at Basel, Erasmus had turned down numerous offers in other cities, including Vienna, Ingolstadt, Zurich, and Spain, in order to maintain his independence from the Reformation controversy. After Basel, he was left with little choice but to immigrate to Catholic Freiburg under the care of Ferdinand, then-archduke of Austria and later emperor, whose older brother, Charles, was once Erasmus’ patron in Burgundy. The remainder of his life was uneventful before dying in 1536 in Basel on his way back to the Netherlands. His controversial writings remained contested during the later Counter Reformation. Some were placed on the 1555 Index of Prohibited Writings and many others were deemed objectionable for certain arguments. His popularity remained amongst Protestants, however, and later reform-minded Catholics in the seventeenth century, leading to the publication of his collected works between 1703 and 1706 in ten volumes.